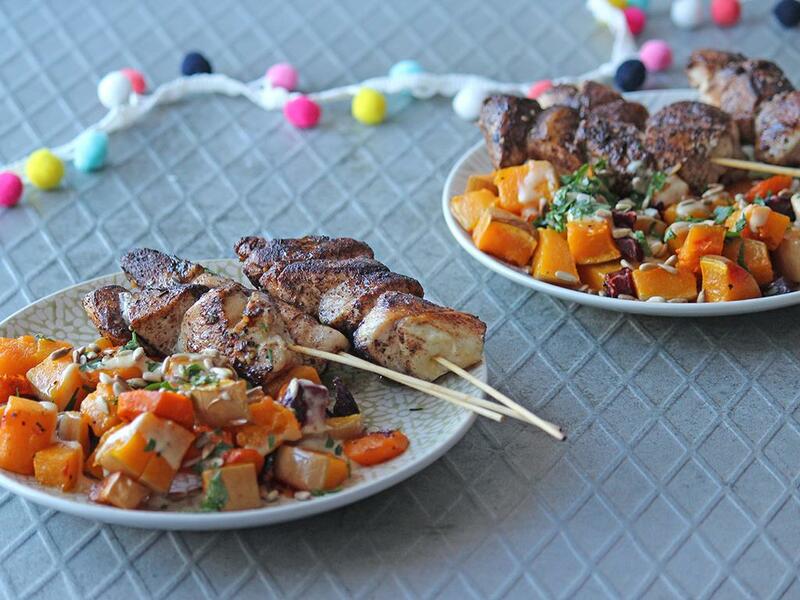 Baharat spiced chicken skewers served with roast veggies & tahini on the side. Roast veggies: Place the beetroot, butternut and carrots on a tin foil lined baking tray with a drizzle of olive oil and season with salt and pepper. Mix and arrange in a single layer (make sure not to overcrowd the tray, rather use two trays). Roast for 20-25 minutes until golden and cooked. Chicken skewers: Thread the chicken cubes onto the skewers, season with salt and pepper and sprinkle with the Baharat Spice Mix. Place a pan on medium-high heat with a knob of butter. When the butter has melted, add the chicken skewers and cook for 8-10 minutes, turning every 2 minutes to make sure they’re cooked through and browned evenly. Serve the chicken skewers with the roast veggies. Sprinkle over the chopped parsley and toasted sunflower seeds and drizzle over the tahini.